If you are experiencing an emergency or life threatening event, which requires immediate attention, please call 911. HealthCare Choices provides after hour access 24 hours/7 days a week for all its locations. By calling the health center number, you will reach this service after normal business hours. Depending on your appointment type, you can expect to be greeted by front-end staff and asked to sign in and have a seat in the waiting room. HealthCare Choices is always accepting new patients. Staff will work with you to complete the Intake packet and obtain insurance information. Please bring a list of all the medications you are currently taking. You are asked to inform the front staff if you have any medical condition that requires immediate attention. A new patient is asked to arrive at least 15 minutes prior to the appointment time to ensure paperwork is completed for the provider. No. HealthCare Choices does not have imaging services on site. We collaborate with diagnostic facilities and refer to them as needed. Your doctor will make this decision and choose the nearest location for your convenience. Do you examine children at your Health Center? HealthCare Choices provides care both for the sick and healthy child. We recognize the difficult job in raising a child from infancy to adulthood and want to offer a partnership between you, your child and your physician. HealthCare Choices providers will prescribe medication as necessary. Please let us know in case you have any allergy or other medical condition. If you have already been taking drugs prescribed by another doctor, please bring them with you for clarification or possible drug interactions and correlations with the new condition. We accept Medicaid, Medicare and most insurance plans. We offer a sliding fee scale for anyone who meets the required qualifications. Please contact us if you need further information. Primary Care services do not need a referral. Please check with your insurance for particular instructions surrounding specialty referrals. 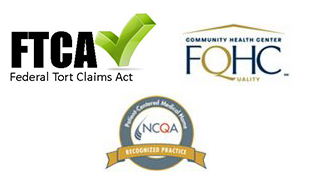 Insurance companies require referrals for some medical services. Our primary care providers can refer you to specialists and HCC will write the referral. There is street parking available at all our facilities. All HealthCare Choices facilities are ADA compliant.